Just a quick sketch today inspired by Rosy. She really is fascinated by the TV, especially anything with animals or animation. Family Guy especially drives her nuts! Sunny doesn't care about the TV and will only start barking (or pug awoowooing) if Rosy starts barking and jumping. 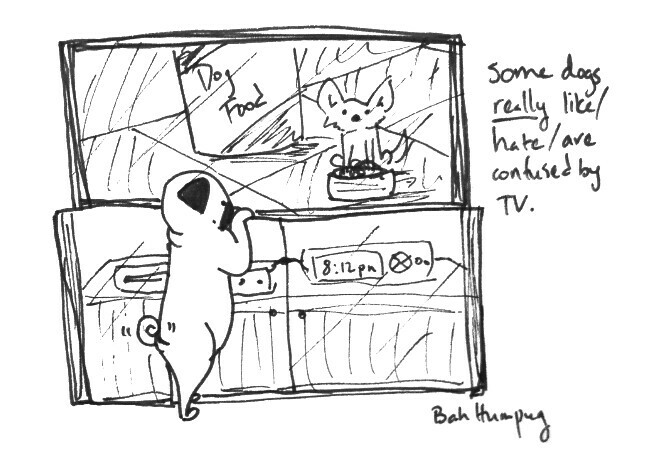 My sister's pug is the same as Rosy to the point where we couldn't watch anything with animals on it. My pug, Mason, is the same way. He particularly is not fond of puppets or any sort. I think he thinks he must "kill" them like he does his toys. My other pug, Eddie, could care less about anything besides naps and eating. I absolutely LOVE your cartoons. Thank you for sharing them! Suki goes crazy when there are dogs or other animals on the television. Sometimes it applies to certain humans as well-- maybe just the really hairy ones? This is so cute and funny! 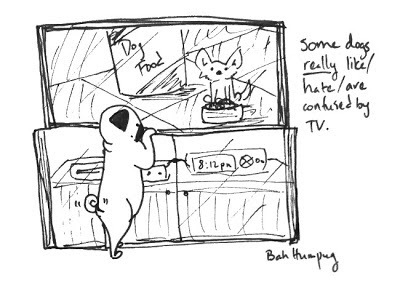 My sister's pug is the same as Rosy to the get it now point where we couldn't watch anything with animals on it.